Celebrate Life by Celebrating technology. Don’t just Cerebrate Life and technology! Things are incredibly simpler yet why are our lives more complex than ever before? Because, instead of using it, we are getting used by technology! Today’s my daughter’s 21stbirthday! Vaani and I made a film (by ourselves; with no outside help! ), with a selection of pictures from her Life, on Windows Movie Maker, to commemorate this special day. We hosted it on a private channel on YouTube. And sent the link to key family members across the world on a WhatsApp thread. Can you imagine this being possible just 20 years ago? This is a new era. A simpler era. Where Google, and not Britannica Encyclopedia, is the fountainhead of all knowledge. Where, whether it is about cooking a meal with quinoa or it is about decoding an acid reflux situation or it is a query relating to the original Neerja Bhanot, you can source, all that you want, any time you want, in a nano-second. It is also an era where you can buy a movie ticket, a plane ticket, book a hotel room or order a book or pizza, from your mobile device. And you can also transfer money from one phone to another! You can stay connected with me__or someone who you may have never met in ages or ever__using Facebook and Twitter__without intruding on their time or privacy! The world’s so much smaller, so much closer, things are so amazingly simpler, yet, the billion buck question is, why are we still struggling? Why is it that we still ‘don’t have time’ for our families, our passions and our dreams? Why is it that we are not living fuller, more complete, fulfilling lives, if things have only gotten simpler? The problem is not with the information technology revolution. It has done its job__made Life simpler. It is we humans who have not learnt to adapt and usetechnology. Schumpeter, a weekly column in The Economist once described this state that our race finds itself in, and argued its causes, fabulously well: “…for most people the servant has become the master. Not long ago only doctors were on call all the time. Now everybody is. Bosses think nothing of invading their employees’ free time. Work invades the home far more than domestic chores invade the office. Otherwise-sane people check their smartphones obsessively, even during pre-dinner drinks, and send e-mails first thing in the morning and last thing at night. This is partly because smartphones are addictive…Employees find it ever harder to distinguish between “on-time” and “off-time”—and indeed between real work and make-work. Executives are lumbered with two overlapping workdays: a formal one full of meetings and an informal one spent trying to keep up with the torrent of e-mails and messages. None of this is good for businesspeople’s marriages or mental health.” Schumpeter recommended digital dieting. A kind of rationing of tech-led work time for freeing up more Life time. I would like us to go the extra mile. My two-penny worth: Celebrate Life by Celebrating technology. Don’t just Cerebrate Life and technology! Here’s how I do it. 1. Wear you Life and your attitude to Life on your sleeve. Let people know__even it is bosses, clients or children__who you are and how you live and work. 2. Never allow technology to slave-drive you. You can choose, and therefore please do, to be the Master. 2. Define your quiet or silence or ‘mouna’ periods. About an hour every day. No voice calls. Just remain silent. Focus on whatever you are doing. Whether it is walking, watching a movie or even preparing a report. Just because you are accessible, need not mean you are available. 3. Check your mails, your text messages, your Facebook or Twitter account but don’tbe trigger-(keyboard)-happy. Choose whether and when to respond. Mull over the information streaming in. If it is bad news__a client feedback, an exasperated boss’ rant, a project disaster, a child’s agony__deal with it with patience. Treat the information as an opportunity to spiritually train yourself not to react. If it is good news, don’t exult either. Again spiritually evolve with the opportunity. 4. Flag as favorites some inspirational web pages (such as this one, J!) and visit them each time your mind wavers and grazes on negative emotions __ worry, anxiety, stress. 5. Do all non-core stuff__like paying your bills, transferring money, booking tickets and hotels__online, at times of the week or day when your energy is low. That way you save time for more value creation when your energy is the highest! 6. Take backups of all important data weekly __ phone contacts, mails, computer hard-disk data __ that’s a sure, and the only, way to beat technology letting you down. 7. Remember: An intelligent Master is one who can use the slave, technology, to live a better Life! So, if you find yourself stressed out on any morning by 10 AM, when you are technically supposed to be starting your work day, know that you are to blame for the complexity that defines your Life. And the only way to make your Life simple, is to simply take charge __ of your Life and the technology you have! You will live happily, healthily, soon, after you become the Master again…..! Author AVIS ViswanathanPosted on March 3, 2016 March 14, 2016 Categories Art of Living, Digital Dieting, Google, http://schemas.google.com/blogger/2008/kind#post, Inner Peace, Intelligent Living, Neerja Bhanot, Schumpeter, Technology-slave, The EconomistLeave a comment on Celebrate Life by Celebrating technology. Don’t just Cerebrate Life and technology! Be an intelligent master – use technology, don’t get used (read cooked) by it! Things are incredibly simpler yet why are our lives more complex than ever before? As I write this my son has reached out to me all the way from Denver, Colorado, in the US. Another young man has pinged me from New Orleans in the US. Yet another has sent me a facebook message from Singapore. And an old school mate, someone who I have not met in 40 years, has written me a note from Canada. All this has happened in just a span of 30 minutes. Can you imagine this being possible just 20 years ago? This is a new era. A simpler era. Where Google, and not Britannica Encyclopedia, is the fountainhead of all knowledge. Where, whether it is about cooking a meal with quinoa or it is about decoding an irritable skin rash or it is a query relating to when was the original “Ocean’s Eleven” movie released, you can source, all that you want, any time you want, in a nano-second – from your smartphone! It is also an era where you can buy a movie ticket, a plane ticket, book a hotel room or order a book or pizza, from your mobile device. And you can also transfer money from one phone to another! You can stay connected with me__or someone who you may have never met in ages or ever__using facebook and twitter__without intruding on their time or privacy! The world’s so much smaller, so much closer, things are so amazingly simpler, yet, the billion buck question is, why are we, the people, still struggling? Why is it that we still ‘don’t have time’ for our families, our passions and our dreams? Why is it that we are not living fuller, more complete, fulfilling lives, if things have only gotten simpler? The problem is not with science and the technology revolution. It has done its job__made Life simpler. It is we humans who have not learnt to adapt and use technology. I remember reading a piece in The Economist a couple of years ago which describes this state that our race finds itself in and argues its causes fabulously well: “…for most people the servant has become the master. Not long ago only doctors were on call all the time. Now everybody is. Bosses think nothing of invading their employees’ free time. Work invades the home far more than domestic chores invade the office. Otherwise sane people check their smartphones obsessively, even during pre-dinner drinks, and send e-mails first thing in the morning and last thing at night. This is partly because smartphones are addictive…Employees find it ever harder to distinguish between “on-time” and “off-time”—and indeed between real work and make-work. Executives are lumbered with two overlapping workdays: a formal one full of meetings and an informal one spent trying to keep up with the torrent of e-mails and messages. None of this is good for businesspeople’s marriages or mental health.” That piece in The Economist, I remember, advocated digital dieting. A kind of rationing of tech-led work time for freeing up more Life time. I would recommend we go the extra mile. My two-penny worth: Celebrate Life by celebrating technology. Don’t just cerebrate Life and technology! Here’s how I do it. 1. Wear your Life and your attitude to Life on your sleeve. Let people know__even if it is bosses, clients or children__who you are and how you live and work. 2. 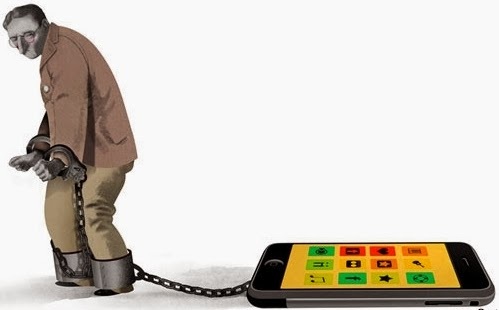 Never allow technology to slave-drive you. You can choose, and therefore please do, to be the master. 2. Define your quiet or silence or ‘mouna’ periods. About an hour every day. No voice calls. Just remain silent. Focus on whatever you are doing. Whether it is walking, watching a movie or even preparing a report. Just because you are accessible, need not mean you are available. 3. Check your mails, your text messages, your facebook or twitter account but don’t be trigger-happy. Choose whether and when to respond. Mull over the information streaming in. If it is bad news__a client feedback, an exasperated boss’ rant, a project disaster, a child’s agony__deal with it with patience. Treat the information as an opportunity to spiritually train yourself not to react. If it is good news, don’t exult either. Again spiritually evolve with the opportunity. 4. Flag as favorites some inspirational web pages (such as this one: J!) and visit them each time your mind wavers and grazes on negative emotions __ worry, anxiety, stress. 5. Do all non-core stuff__like paying your bills, transferring money, booking tickets and hotels__online, at times of the week or day when your energy is low. That way you save time for more value creation when your energy is the highest! 6. Take backups of all important data weekly __ phone contacts, mails, computer hard disk data __ that’s a sure and the only way to beat technology letting you down. 7. Remember: An intelligent master is one who can use technology to live a better Life – and not get used (read cooked) by it! So, if you find yourself stressed out by Monday morning 10 AM, know that you are to blame for the complexity that defines your Life. And the only way to make your Life simple, is to simply take charge __ of your Life and the technology you have! You will live happily, healthy, soon, after you become the master again…..! Author AVIS ViswanathanPosted on November 5, 2014 March 14, 2016 Categories Art of Living, Inner Peace, Intelligent Living, Master, Mouna, Silence Periods, Technology-slave, The EconomistLeave a comment on Be an intelligent master – use technology, don’t get used (read cooked) by it!